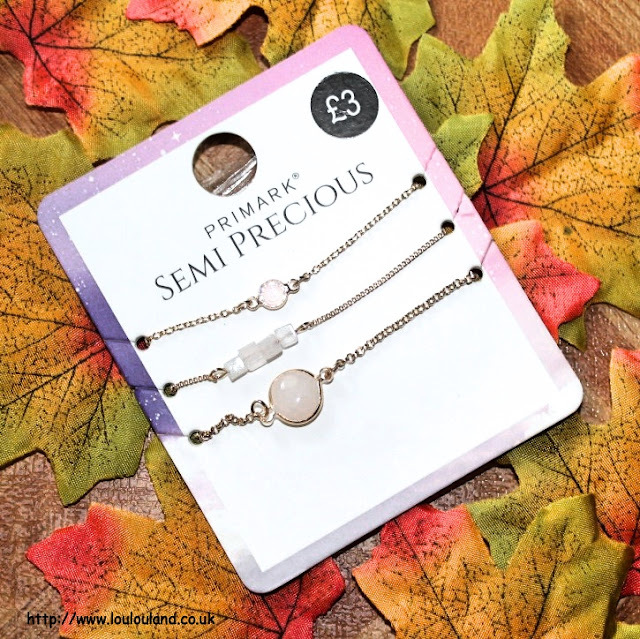 Ahh Primark, nothing lifts my mood than a bit of budget indulgence. Like most stores Primark's prices have increased but it's still one of the cheapest places on the high street to buy clothes, accessories and home wear, and I never, need an excuse to fill my basket. 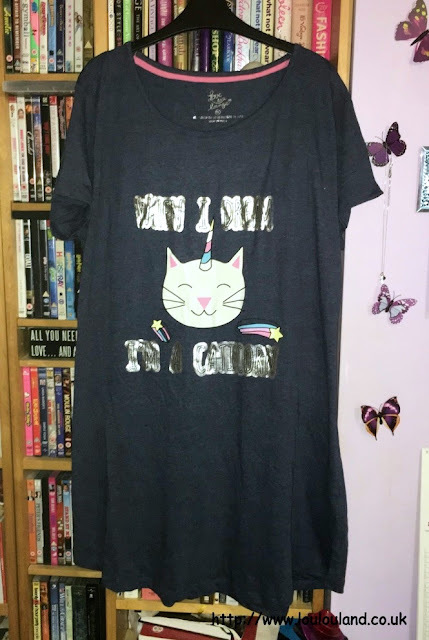 I've got quite a bit to show you so I'm going to quit the babble and get started, and the first item that I picked up was this sleep tee, which was just £4.50 from the Newcastle store. 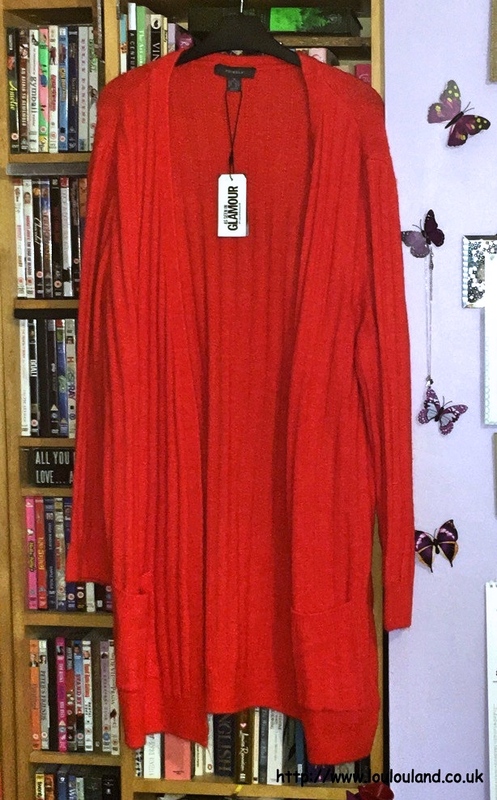 When I bought it though, I committed the cardinal sin, and didn't check that the size on the nightshirt corresponded with the size on the hanger grrrr. 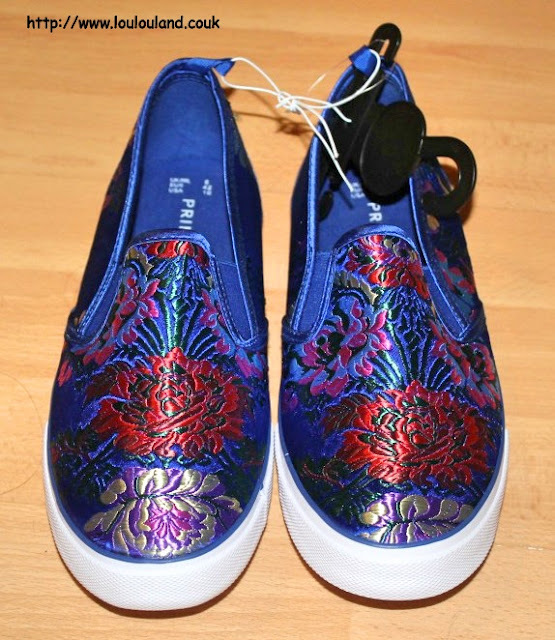 Thankfully when I went back to exchange it in the Intu Metrocentre store and there was one left in my size! Call it fate or the luck of the Unicorn or the feline but I'm happy to have this in my life. 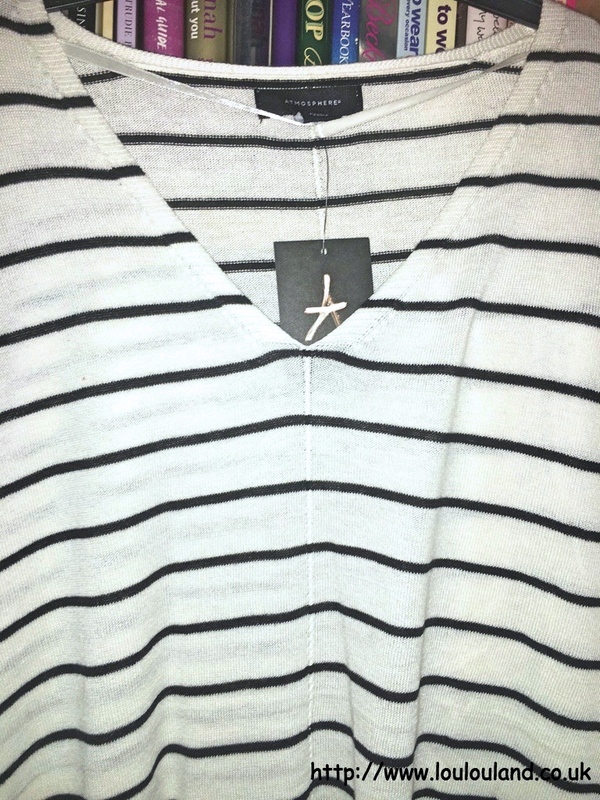 It just a basic over sized t-shirt in a sort of navy blue marl type fabric. 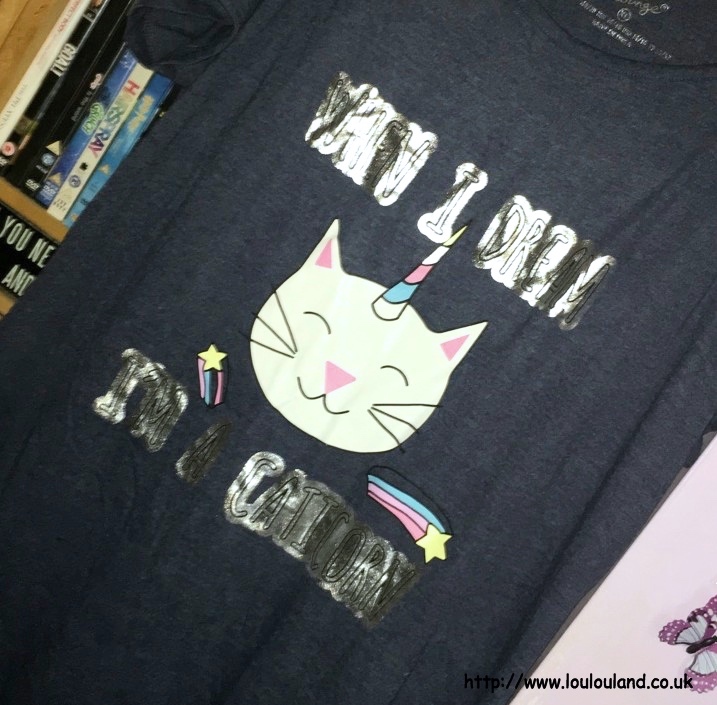 You can't see the writing too clearly in the photos but it says "When I Dream I'm A Caticorn" - cats and unicorns what could be better! Next up something stripy, I've always loved stripes and this year especially, the stores, seem to have caught up with my obsession. A few hauls ago I picked up a basic, short sleeved, striped crew neck t-shirt, and it's something that I've washed, and worn, and washed and worn since I got it. The length is good, and it's super stretchy. 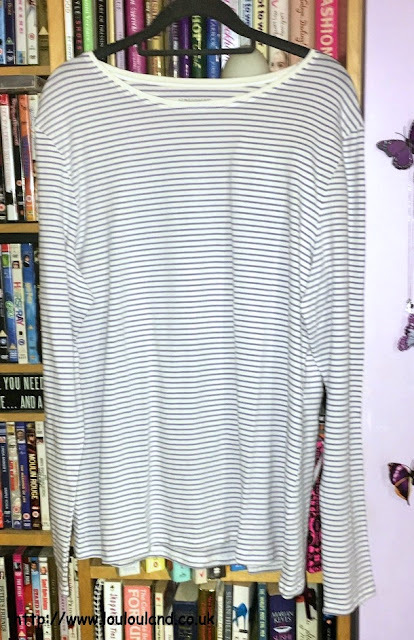 I couldn't see any short sleeved ones on the this trip but I did find a long sleeved version in a few different colours, it was just £4 and I went for the pale blue and white stripe version.I've already worn this and for the price I think it's a pretty decent top, and I'm definitely going to pick up a few plain coloured ones for layering. 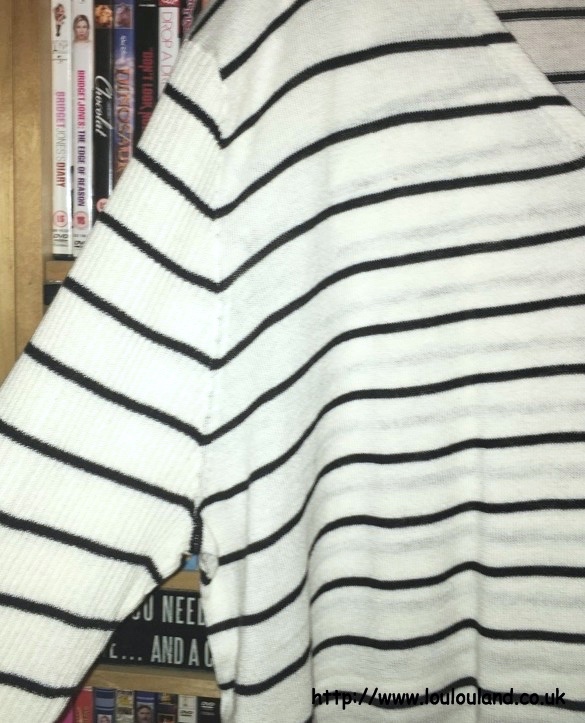 Sticking with the striped theme, I also picked up this jumper. I'm a big fan of knitwear and lightweight pieces like this one are perfect for pretty much any season in the UK. It's officially described as a Step Hem Jumper, and it's does have a bit of curved, uneven hem thing going on. 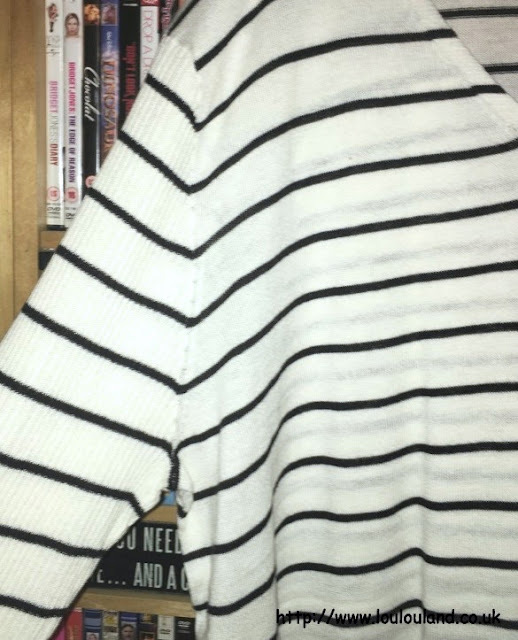 It's in a slightly off white with a thin black stripe. 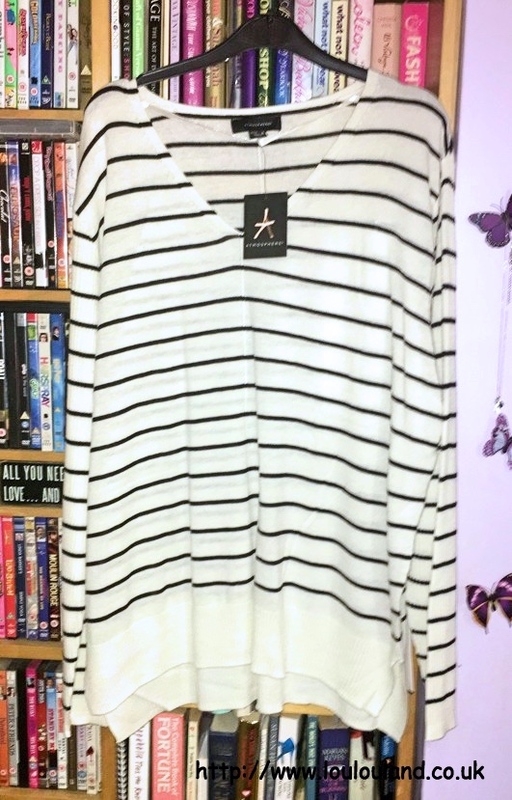 It also features a bit of ladder detailing, and rib detailing on the hem and sleeves Again it comes in a few different colours including different stripes and plain colours and it was just £8. 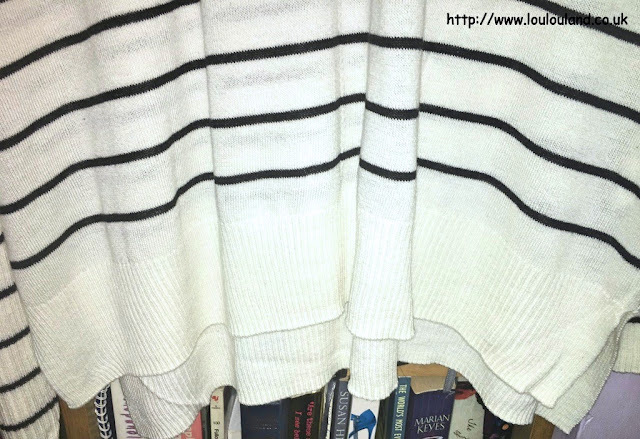 I know they can often be seen as a little bit, grannyish, but I do love a cardigan, no I'll admit it I'm slightly obsessed with cardigans, I probably have enough cardigans in my wardrobe to start my own little cardigan shop but come on! they are just so useful. I love layering, and I always want to cover bits of my body that I'm not feeling very confident about, and cardigans fit the bill perfectly, and when I saw this one, it was woolly love at first sight. This is one of the pieces from Primark's collaboration with UK Glamour magazine. 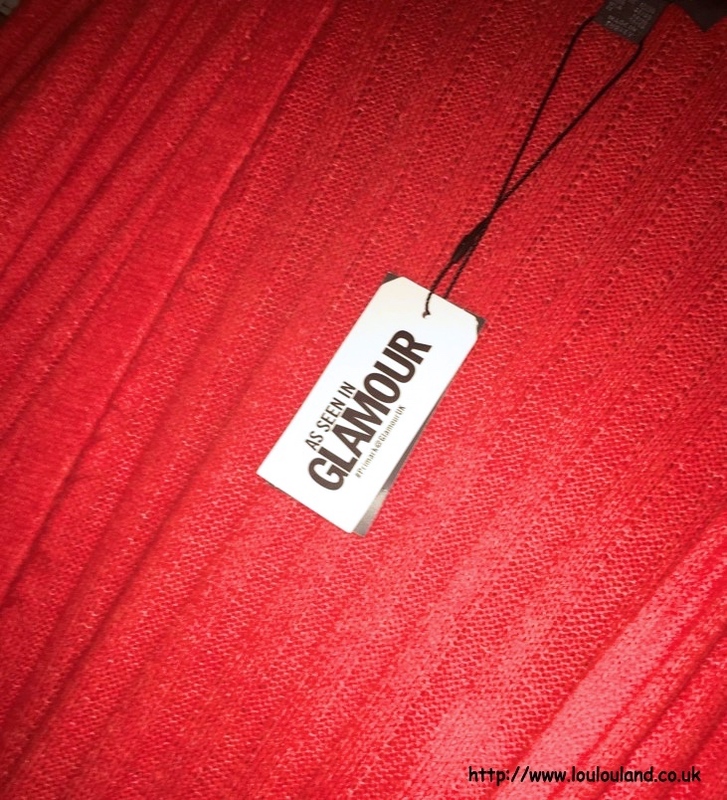 I don't know the extent of the collaboration but a lot of the new Autumn and Winter pieces are tagged with As Seen In Glamour, so I'm assuming it's just a promotional feature but they had some really nice bits including this officially red, but really more like a bright, orange red cardigan. It's long length, in a wide ribbed design, it has no buttons or fastenings and it has pockets. 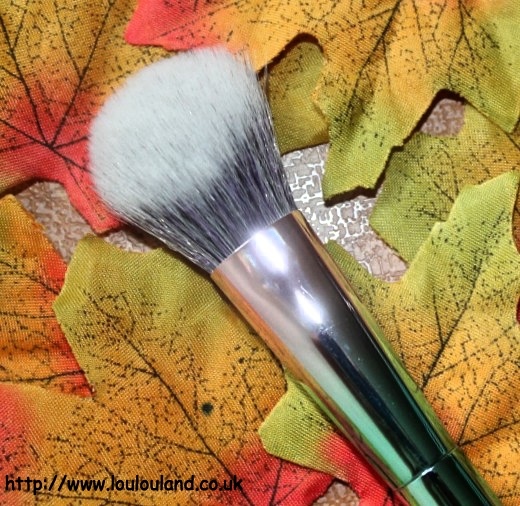 It was £13 and although it's made of largely synthetic fibres, it definitely feels a lot more expensive than it is, if you like the idea of angora but you won't buy if for ethical and animal rights reasons this could be something to try. 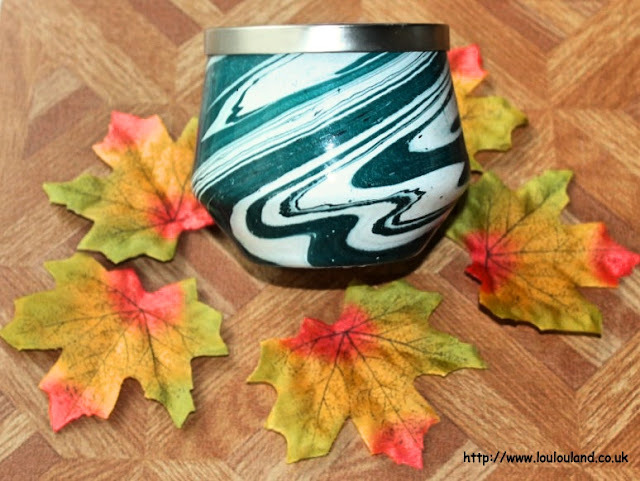 It's the perfect autumnal bright and I can't wait to wear over jeans, leggings, and I'm even planning on wearing it over a plain black dress to give it a pop of colour. When you shop in Primark as regularly as I do you come to the realisation that there are products that you always buy, things that you always use or things that you'll repeat purchase. For me it has to be Primark's viscose leggings, I don't wear leggings outside of my front door that often, but when I'm spending the day at home, they really are my go to. 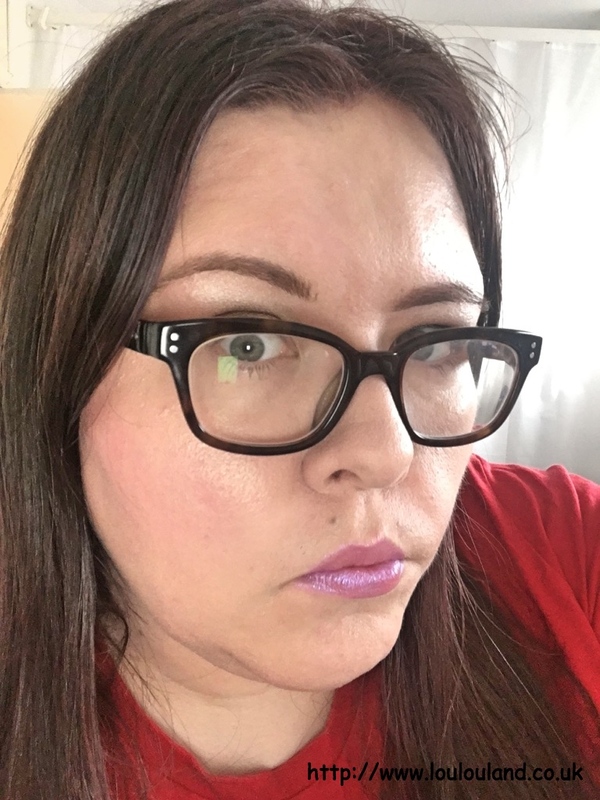 They retail at around £2.80 a pair, and they're actually pretty decent for the price, they hold their shape, and they aren't completely see through - it's a win, win thing, and every now and then I'll buy a couple of pairs. 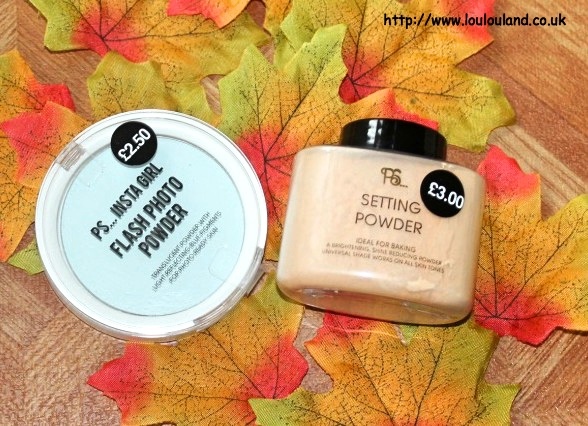 As well as leggings there are a couple of Primark's beauty products that are also on my repeat purchase list. First up the PS Oil Balancing Cleansing Wipes With Tea Tree And Witch Hazel, I've lost count of how many packets of these wipes that I've bought over the years, I use them for all sorts of things and to be honest they are actually even better than the used to be. The last few packets that I've bought have been sightly thicker and textured but the price has remained the same, it's just a £1 for 2 packs of 25 so I never feel guilty stocking up when I'm in store. One of my newest Primark must haves has to be the PS Cuticle Oil, which is just a £1 a bottle. When I first bought this I wasn't expecting a lot but I'm a convert, I love the Original OPI Avoplex but this stuff is nearly as good for a fraction of the price. If you have dry nails and cuticles this is well worth trying. 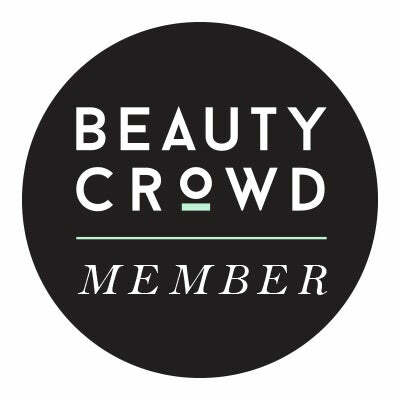 The PS Insta Girl line seems to be a whole range of face, and make up perfecting, make up items, and beauty tools, that are designed especially for the selfie taking, Instagram obsessed generation. 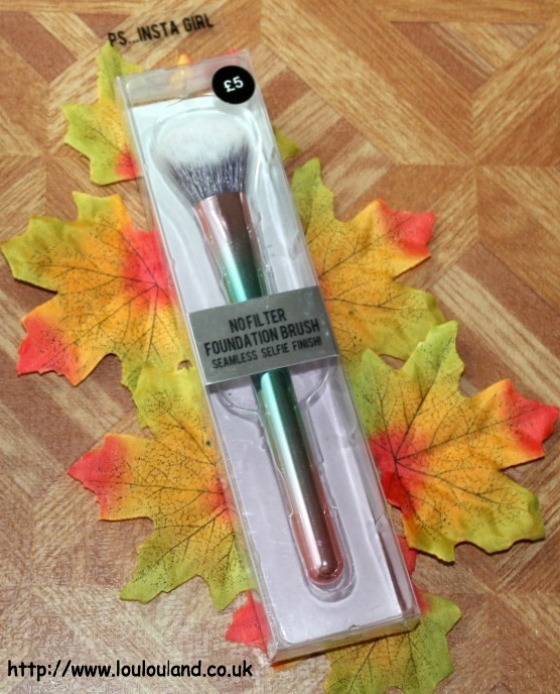 As well as innovative make up items it also contains a range of droolworthy make up brushes. 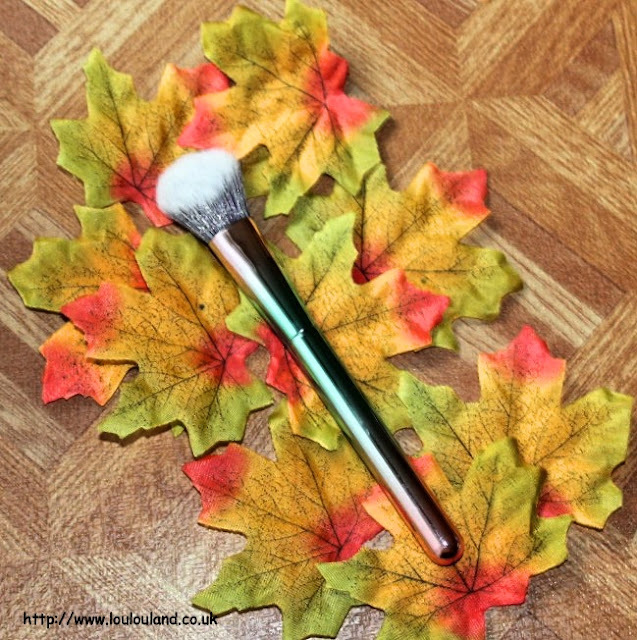 The individual brushes are a little bit pricier than some of Primark's other brushes but they I loved the metallic ombre design so much that I couldn't resist trying the PS Insta Girl No Filter Foundation Brush which was £5. Like all the other brushes that I've tried from Primark the hairs are super soft, and it's actually a pretty decent, and well made make up brush. Did I need it? did I hell! but I couldn't resist it! 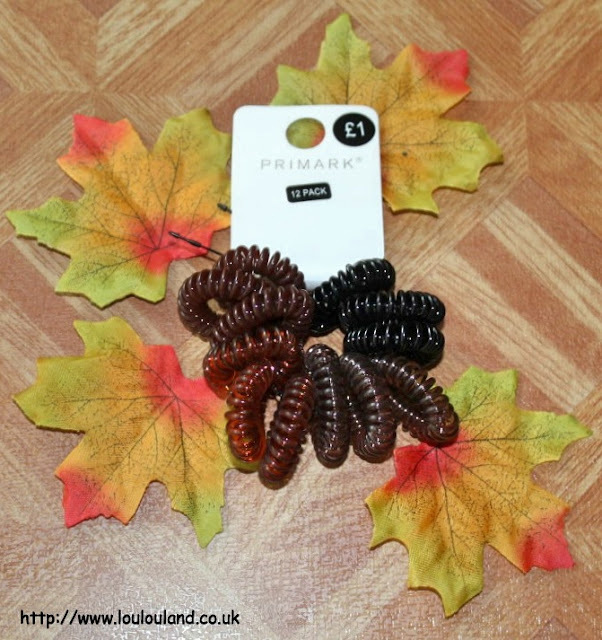 Another Primark item that nearly falls into my must buy on every trip, is their spiral hair bobbles. I buy hair bobbles all the time, but when I need one I can never, ever find one - it's like hair grips, and socks - where do they go? These packs of 12 which are just £1 each, are a very similar to several higher price alternatives. They made of a rubbery plastic, so they don't snag the hair, and they don't lose their shape straight away. This time round I got a pack of navy blue bobbles and a pack which contains several different shades of brown bobbles. 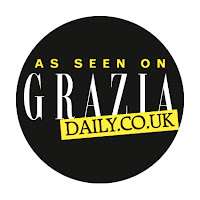 As much as I love jewellery I'm starting to think that maybe I need to stop buying so much, as well as a cardigan shop, based on my own collection I could easily set up, and stock my own jewellery shop, I really do have that much! So I looked at the jewellery section, picked up one pieces and walked away! This is just a set of 3 Semi Precious Bracelets containing what looks like Rose Quartz. The set was £3 and it reminded me of Monica Vinader and some of the Z For Accessorize pieces which I love. If you could sum this post up in one phrase it would probably be "I didn't really need it but..." and guess what it applies to these next two items as well! 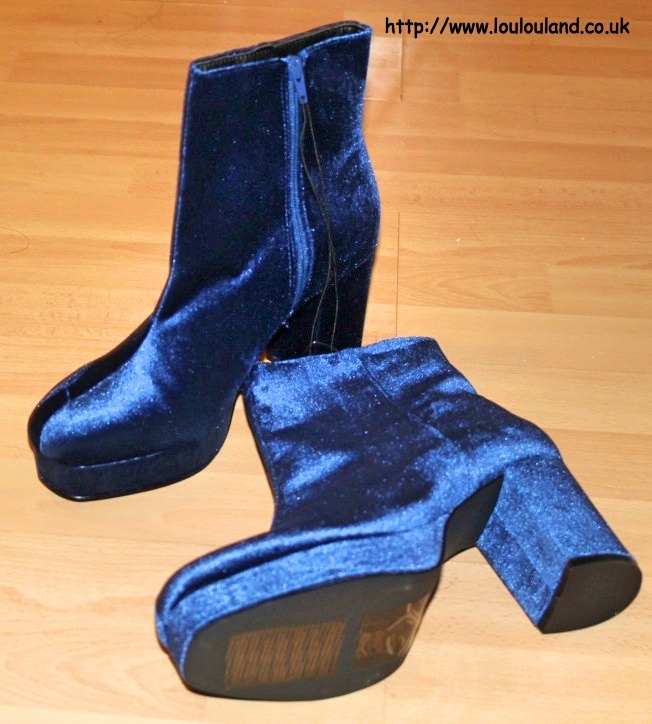 I don't need any more shoes, or at least I don't need any more less than sensible shoes but again I couldn't resist. 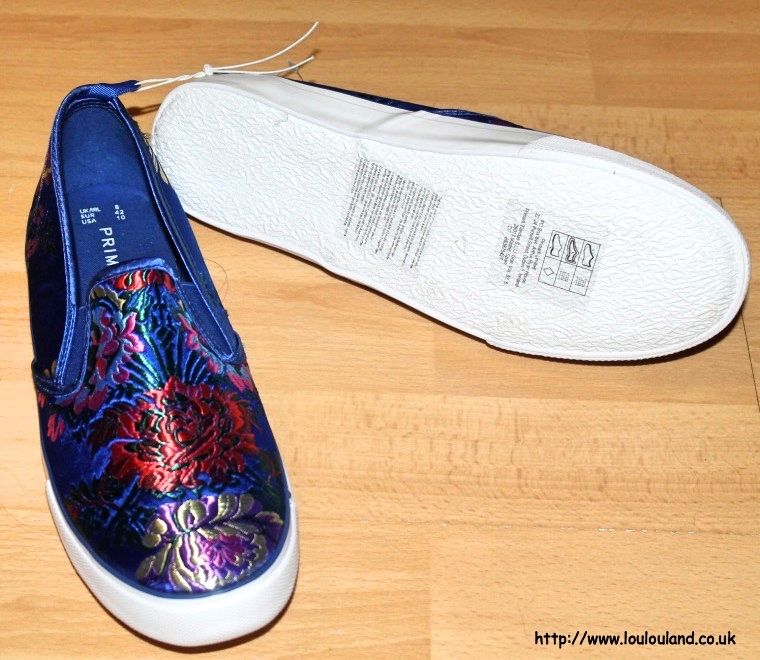 I do love a bargain though and these fabulous slip on pumps were only £3 having been reduced from £8. 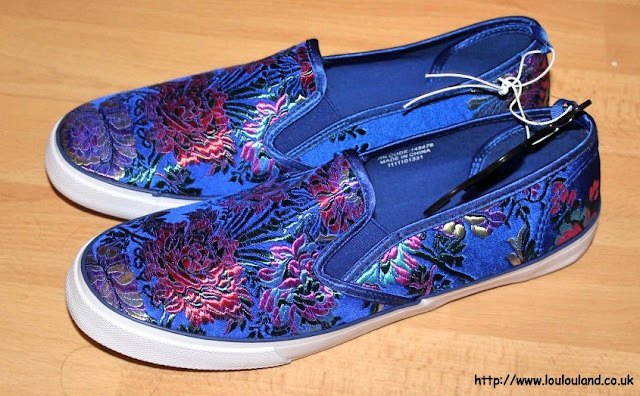 They are comfy but they certainly aren't for the faint hearted, they're made of a bright blue satin, and the feature an embroidered, almost oriental style floral design. I love a bit of colour and I think that these flats will be perfect for jazzing up a plain outfit, like for example a pair of jeans and a plain white t-shirt. 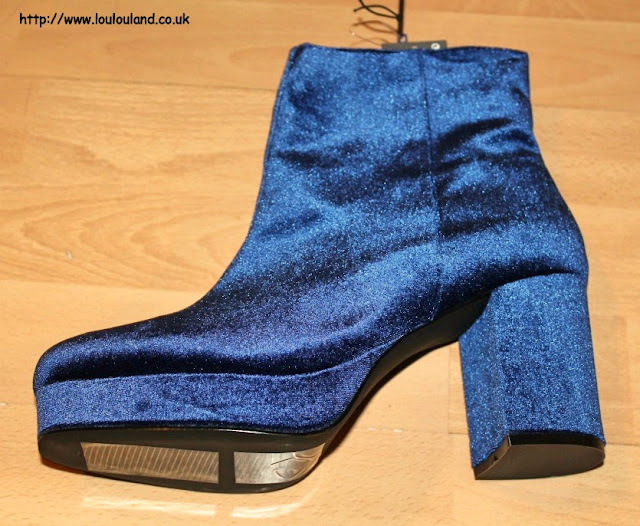 For as long as I can remember I've loved velvet, and in particular blue velvet, no I don't mean the film, even though I'm a big David Lynch fan, I mean the fabric, and in particular I have a bit of a thing for velvet footwear, so when I saw these boots, which were just £16 it was inevitable that the would end up in my basket. Are they practical? not really, can I walk in them? if I concentrate I can I guess, why did I buy them then? Well just look at them they are so pretty, even if I don't wear them I might find a way of putting them on display, I just don't want to destroy their velvet loveliness. Pointless purchase? NEVER! If you've made it this far, well done, I know that this haul to put it politely was a long one, never mind I'm nearly done I just have 3 home related pieces to show you, including a band waggon jump. 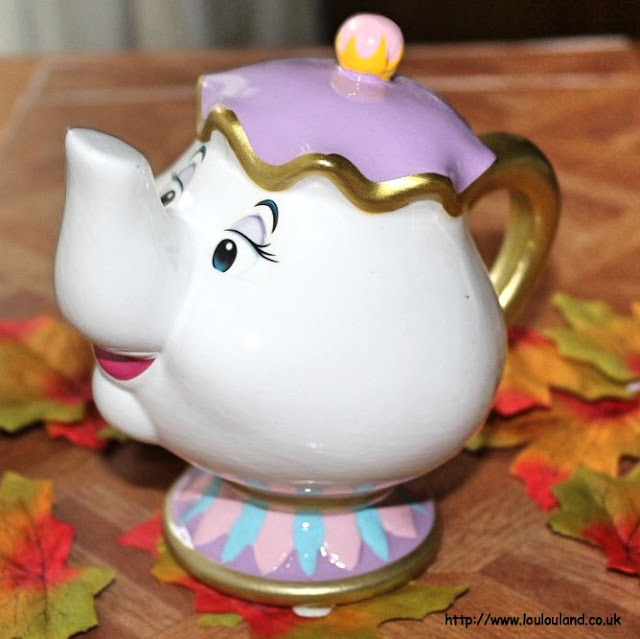 Yes I managed to jump on the Primark, Beauty And The Beast band waggon, with a little Mrs Potts purchase. Unfortunately it wasn't the actual teapot, does that even exist? 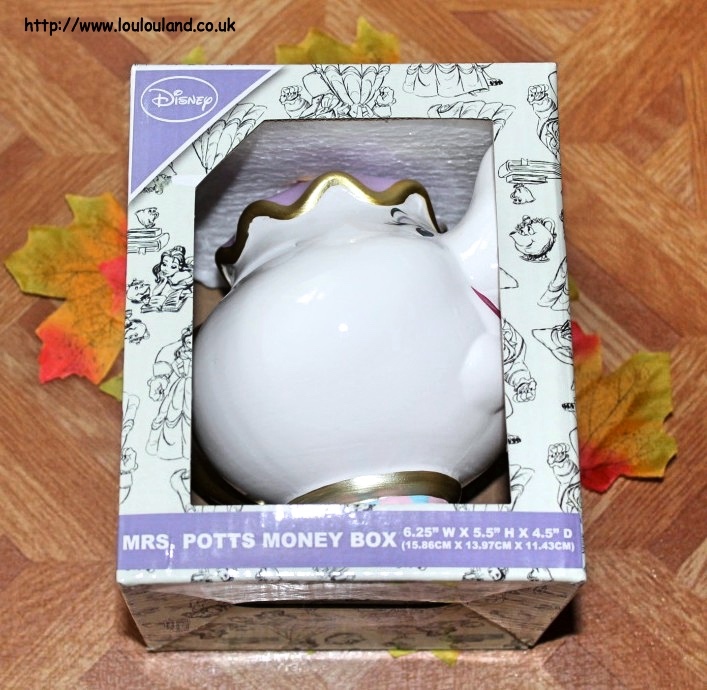 but it was the next best thing, the Mrs Potts Money Box. 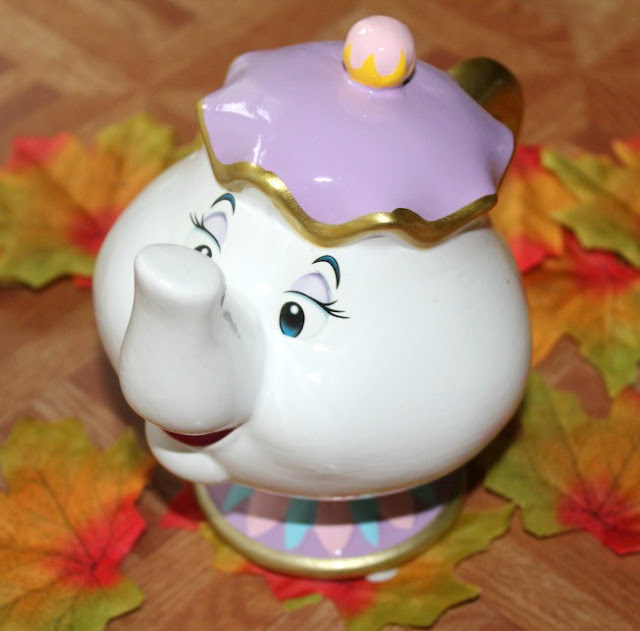 I have quite a few money boxes, and piggy banks in my collection, and think that this ceramic Mrs Potts will fit right in. 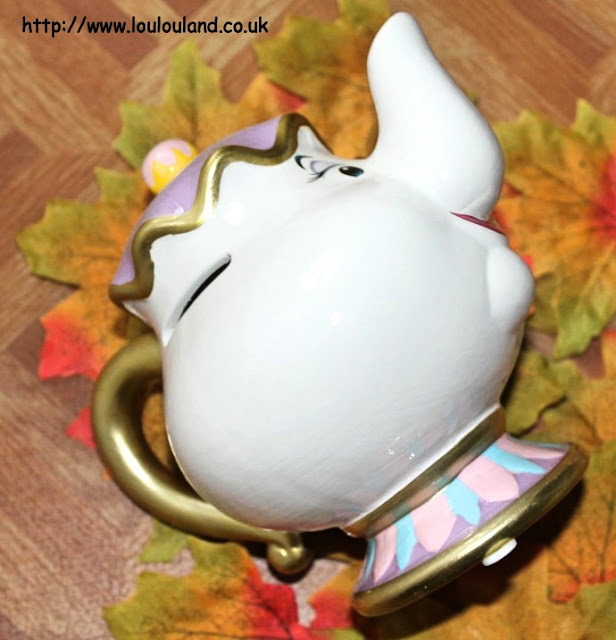 It was only £8 and I think that it would make a great gift for either a Disney fan or a money box collector, no matter what their age. 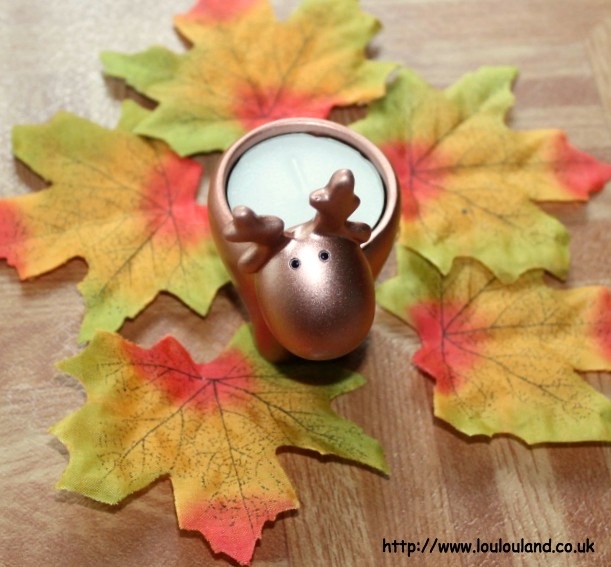 So, so cute and something else that's pretty cute is this Reindeer Tealight Holder, which was just £1.50. 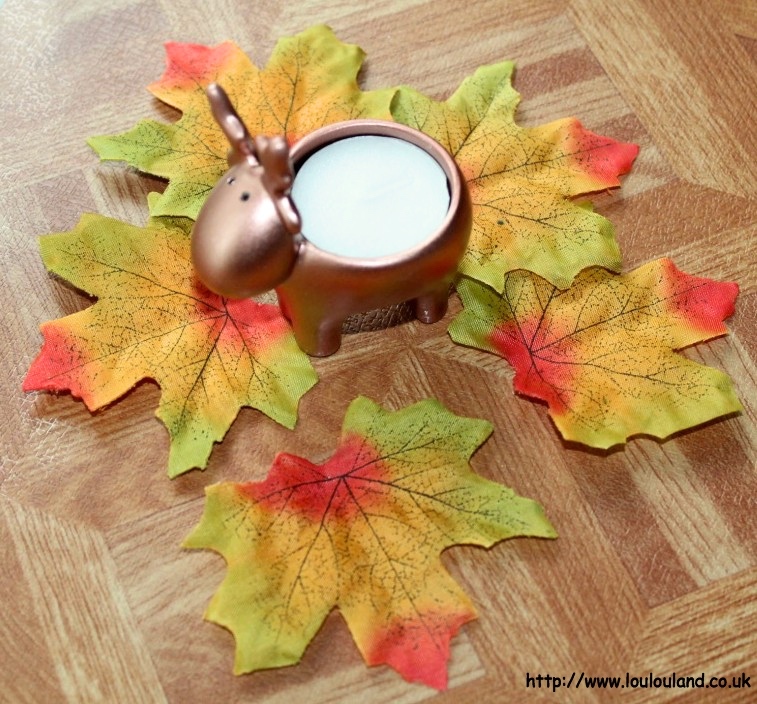 I know it's still a little bit early to start thinking about Christmas but there is nothing wrong with being prepared! Last time I went in Intu Metrocentre Primark, they were just starting to put their Christmas things out and I spotted this little guy. I already own him in white for a year or so ago, and since he was a bit lonely I had to pick up this bronze toned version as well. It was just £1.50 and it also contains an unscented tea light. My final purchase was something else that was candle related, and like so many stores at the moment Primark have really upped their candle and home fragrancing game. 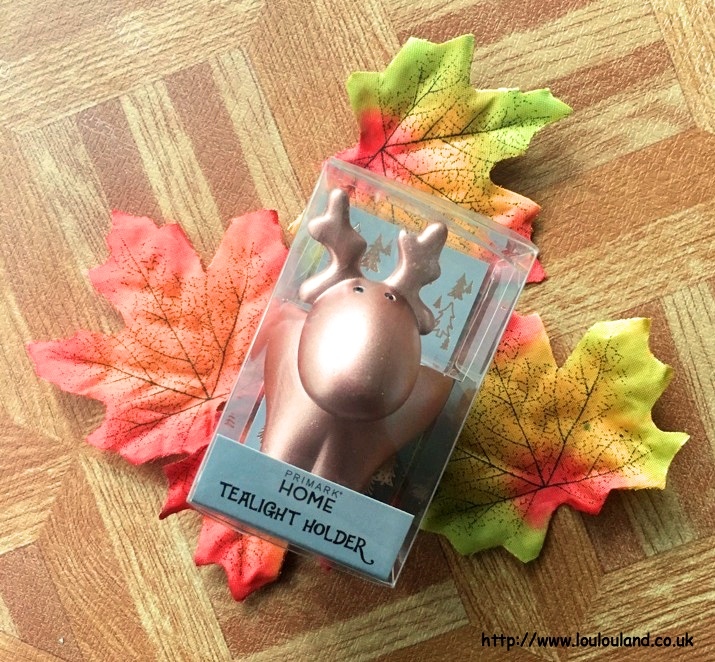 With Jo Malone alikes, decent reed diffusers, and a Salted Caramel Brownie candle that everyone seems to have gone mad for, if you like a bit of home scent Primark is the place to go. 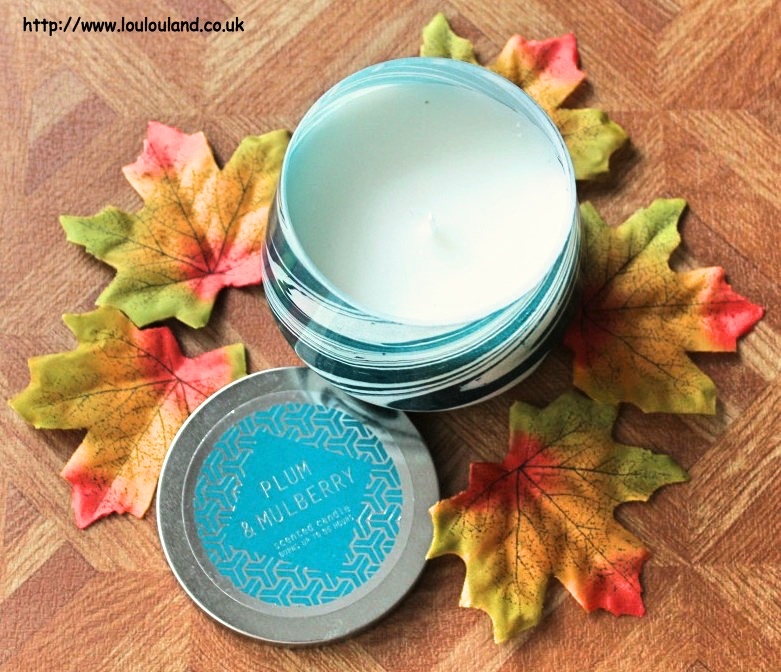 Since I've recently purchased a few foodie scented candles I thought I'd try one of their fruitier options, and this one fit the bill perfectly. 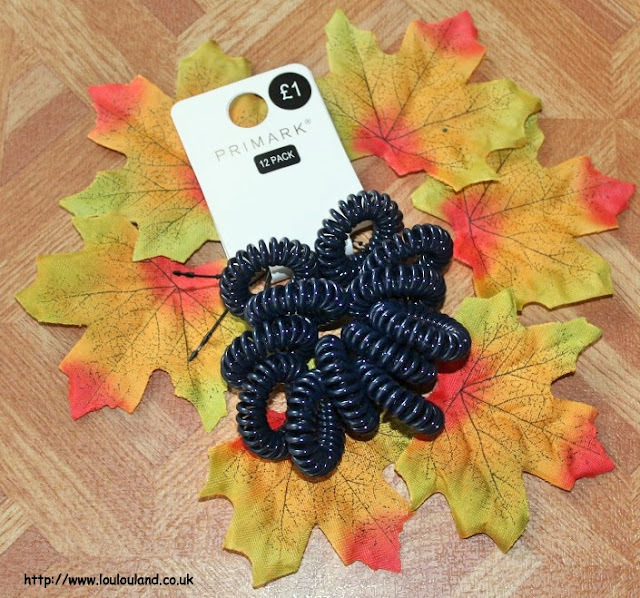 So it was long, and drawn out and I didn't need most of it but hey, I probably spent a lot less in Primark than I would have done elsewhere for similar stuff. I've made a little (haha) You Tube video to accompany this haul that you can watch below or via this link.